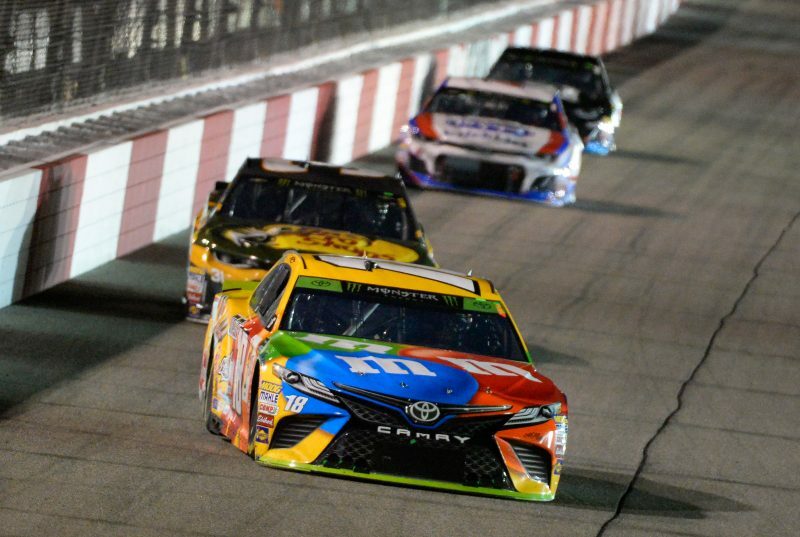 Kyle Busch has won the second of the Monster Energy NASCAR Cup Series Playoff races with a measured drive from the rear of the field at Richmond Raceway. The #18 Joe Gibbs Racing Toyota started 39th (second last) after being sent to the rear for post-qualifying repairs, but Kyle Busch drove through the field and into Victory Lane at the 0.75mi short-track. It came after a late duel with Brad Keselowski (#2 Team Penske Ford), the pair exchanging blows at the head of the field before Kyle Busch out-foxed him and made the decisive lead change on Lap 364 of 400. Keselowski fell back as pole-sitter Kevin Harvick (#4 Stewart-Haas Racing Ford) closed up on Car #18 late in the piece, but could not get to bumper of the Camry to make a move. Harvick finished second while Martin Truex Jnr (#78 Furniture Row Racing Toyota) completed the top three. Chase Elliott (#9 Hendrick Motorsports Chevrolet) ran strong for much of the night, finishing fourth after leading early in Stage 3. Aric Almirola (#10 Stewart-Haas Racing Ford) was fifth, from Austin Dillon (#3 Richard Childress Racing Chevrolet), Kyle Larson (#42 Chip Ganassi Racing Chevrolet), and Jimmie Johnson (#48 Hendrick Motorsports Chevrolet). Keselowski slipped to ninth and Clint Bowyer (#14 Stewart-Haas Racing Ford) rounded out the top 10. Truex Jnr swept the opening two stages in dominant fashion after swiftly moving by Harvick on the inside on Lap 41. Denny Hamlin (#11 Joe Gibbs Racing Toyota) ran high in the order, but his race unraveled mid-way through Stage 1 when he was tapped into a near spin by Ricky Stenhouse Jnr (#17 Roush Fenway Racing Ford) and had to make a green-flag pit stop, dropping a lap down. However, on fresh rubber, Hamlin was able to un-lap himself and get back into the top 10 with a ninth place result in Stage 1, while Kyle Busch scythed his way up to 13th. Truex Jnr rocketed away on the Stage 2 restart and didn’t look back, winning ahead of Harvick and Almirola, who made up a handful of positions in the first full round of stops. Elliott and Keselowski were fourth and fifth respectively, while Joey Logano (#22 Team Penske Ford) made it back into the top 10 after a green-flag stop in the middle of Stage 2. Winning the race off pit road at the end of Stage 2 was the #9 of Elliott, while an uncontrolled tyre in the stop meant Truex Jnr copped a penalty and was sent to the rear. As the final stage got underway, Harvick gave chase to leader Elliott as Keselowski and Almirola both moved in front of the #4. Keselowski then drove around the outside of the #9 for the lead on Lap 214. Deeper into the stage, Elliott’s car came back on and he re-gained the lead on Lap 244, cutting underneath Keselowski. On Lap 270, a number of the front running cars dived into the pits for a round of green-flag stops, but leader Elliott came in a lap later than those around him and lost out. Keselowski inherited the top spot ahead of Kyle Busch, who steadily closed in on the #2 and then drove by him on Lap 287 for the lead. The first and only unscheduled Caution of the race for an incident came on Lap 325 when Jeffrey Earnhardt (#96 Gaunt Brothers Racing Toyota) spun off Turn 2 after being tapped by Matt Kenseth (#6 Roush Fenway Racing Ford). It proved disastrous for Hamlin, who had just dived into the pits and lost significant time, falling outside the top 15. Keselowski immediately challenged for the lead on the restart and drove around the outside of Kyle Busch on Lap 343 as the top two duked it out. Kyle Busch went back to the lead on Lap 364 and would stay there, as Harvick picked up second when Keselowski began to fall backwards and his hopes of a fourth straight win faded along with the life in his rear tyres. Despite his efforts in the last laps, Harvick fell 0.7s short of race winner Kyle Busch at the line, whose victory buys him a ticket into the next round of the Playoffs. The win is the 50th of his career and seventh of the season. Hamlin finished 16th and is 29 points off 12th position with a race left in the Round of 16. Points leader Truex Jnr is safe in the Round of 12 along with Kyle Busch and Las Vegas winner Keselowski. Charlotte Motor Speedway’s ‘Roval’ hosts the next race on the weekend of September 28-30 (local time).